Imagen Enterprise Video Platform is an award-winning company providing a secure, user-friendly portal for storing, accessing and sharing video and online content. It is used in a huge range of industries to help companies of all sizes to store, search and, where relevant, commercialise their growing media libraries. Imagen offers a high-quality service, which includes best-in-class archiving, intuitive interfaces, tailored solutions and total security. However, sometimes in the world of digital it can be difficult to convey the real value and quality of a truly premium product. It can feel intangible to a customer, however necessary, and however sophisticated. To address this gap between perception and product, we devised some suitably swanky – and beautifully designed – presentation boxes for their pre- and post-sales kits. 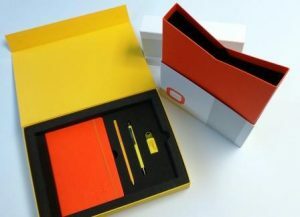 The pre-sales box is a promotional sales tool that cleverly houses a number of items, including a brochure, USB stick, pencil and notebook, all held securely in perfectly sized cavities within a protective foam insert. Constructed from a sturdy 1500 micron board, each box is individually wrapped in layered, textured coloured paper to match Imagen’s bold corporate colours. The design allows the lid to lie flat when open, providing a striking way to display the contents, and an integrated magnetic clip holds it shut firmly when closed. This totally bespoke box is finished off with a foil blocked logo, providing a luxurious and totally unique product. The post sales box, while being a simpler design, is no less impactful. The box is formed of two halves with the lid sliding neatly and precisely onto the bottom section, rather like those cardboard cylinders of colouring pencils that slot together to make a perfect tube. This box is designed to hold all the documentation relating to each client’s agreement/contract, providing a secure and eye-catching storage solution. Elegant and minimal, the box is a clean, crisp white with a striking orange inner, again in line with Imagen’s corporate colours. The box is finished with a foil blocked logo on the front and side, and a shadowed design created and printed to complete the elegance of the finished piece. As well as the boxes, we digitally produced 150 x 36 page brochures in A4 size from the artwork Imagen supplied. We also included a cleverly designed cover with folding flaps at the front and back to hold any loose sheets of paper. This cover was coated in a soft touch silk finish to add a further touch of luxury and value to this already stylish project. We produced a total of 100 of each type of box. “We’ve been working with Victoire for years, and they’re always our first choice for print. When we came up with the idea for the sales boxes we thought we’d need to track down a specialist; but we should never have doubted that Victoire could deliver on a highly demanding project like this. Dominic helped us with every stage of the design and execution process, advising us on all the options available. quality and premium nature of the product and services they represent. A picture may be worth a thousand words, but we like to think that perfectly produced packaging can say even more about a brand.